I would include some pictures and maybe a short video or two of today's travels through some of the most beautiful countryside I've ever seen, but I am having serious internet problems and am unable to do so. But I promise I'll be sharing in the next day or two! The trip is going so well and we're seeing parts of the country we've never seen before. Today's card, another one in the StampNation World Card Making Day blog hop series, represents Germany. This is a may pole in the inspiration photo, and one of the interesting facts that was shared with this inspiration photo was that "young men in Rhineland may put a branch wrapped in colorful ribbons in the garden of a girl he would like to marry. Young women place these branches in the gardens of young men during leap years." 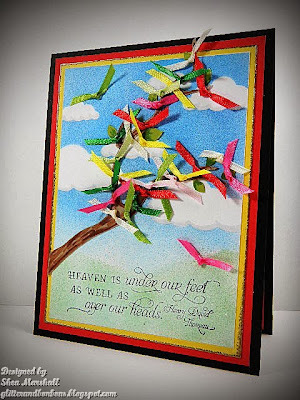 I find that custom sweet and charming, so I designed my card to interpret such pretty branches. The branch itself is a die cut from brown cardstock onto which I added some Copic painting for a little extra interest. I masked the clouds and ground and airbrushed the sky with Copics, then I airbrushed the ground, masking the sky. I added a bit of light grey Copics to the clouds to give them a bit of dimension. 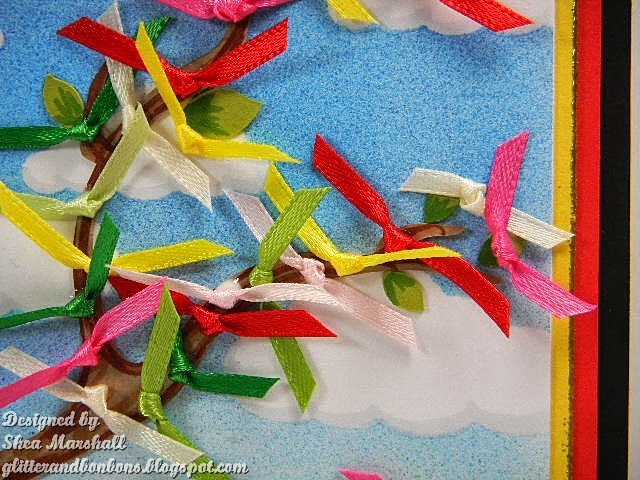 I tied 1/8" ribbons in various colors into small knots, then adhered them to the tree branch. 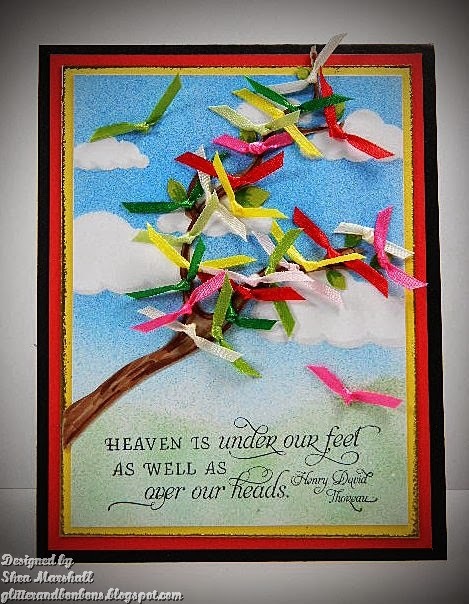 At the end, I decided they actually looked a little like the birds I drew in grade school, so that is my interpretation - colorful birds crowding the branches! The bottom layer of cardstock and two mats represent the colors of the German flag - black, red and yellow. I edged the yellow mat with gold embossing for some added interest. Thank you for joining me, and I wish you a colorful, carefree day!